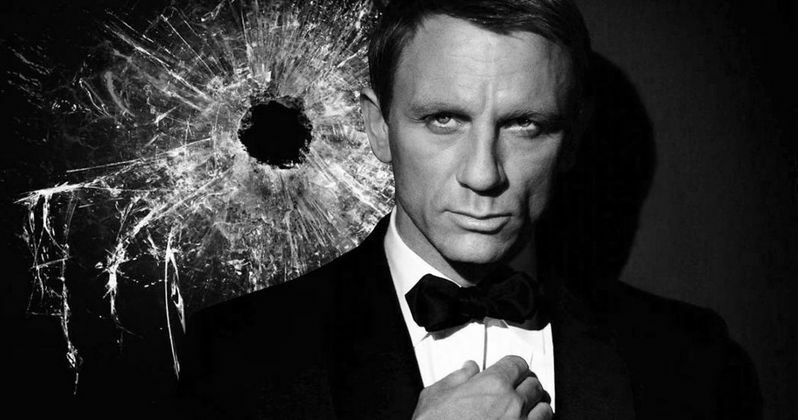 In 2006, Daniel Craig brought his version of James Bond to life for the first time with Casino Royale. Now, ten years later, Craig has turned in four performances as Bond. And though he reportedly has a film or two left on his contract, the future is very uncertain as to whether or not he will return for a fifth and presumably final turn as 007. In fact, many signs point to Spectre being the last film in the Daniel Craig Bond era, for better or for worse. But we think he should come back for at least one more adventure, and finish what he started. During the press tour for Spectre last year, Craig made it very clear that he was less than interested in playing the character again. Speaking with Britain's Time Out, just after filming on Spectre wrapped, Craig had this to say in regards to whether or not he would sign up to do the role of 007 one more time. "I'd rather break this glass and slit my wrists. No, not at the moment. Not at all. That's fine. I'm over it at the moment. All I want to do is move on." Though the report surfaced in October of 2015, the interview was said to have taken place in July almost immediately after filming wrapped on Spectre, which might have contributed to Craig's attitude toward reprising the role for a fifth time. Not only was Spectre a reportedly lengthy and arduous shoot, but Craig was reported to have injured his ACL on the set, and had to get surgery as a result, which also required a fair amount of recovery time. What's further is that Craig's good friend Mark Strong in an interview with The Short List made it sound as though Craig is done with the franchise as well when he was discussing the possibility of playing a Bond villain. So as it stands, things are not necessarily looking great for fans of Craig who want to see him return as Bond. But not all hope is lost, and there are plenty of reasons that he could and should return for one last go. The actors who play Bond are never remembered in the history books for a lone film, with the exception of George Lazenby for On Her Majesty's Secret Service. Rather, they are judged on the sum total of their collected filmography. But no actor has seemed to stick the landing on their last film. Sean Connery officially went out with Diamonds Are Forever, which was at best a mixed bag, though he did reprise the role in Never Say Never Again for a rival studio. But it is not considered part of the official cannon. Roger Moore went out on A View To A Kill, which is considered by many to be his worst outing. And Pierce Brosnan went out with Die Another Day, which is still considered by many to be one of the worst films of the entire series. If Craig were to return for one more film after Spectre, he would very much have the chance to stick the landing, which is something we would all love to see. That is not to say Spectre was a bad film, it actually made many die hard Bond fans quite happy. But it certainly didn't live up critically or financially to Skyfall, which was the first Bond film to gross $1 billion worldwide. However, Spectre did feel like an odd place to end should Craig really be hanging up the tux. At the end of the film, Bond appears to be heading off into retirement with Madeleine (Lea Seydoux) and Christoph Waltz's turn as Blofeld felt very much like it was just beginning. Waltz has indeed signed on for two more films with the caveat that he will only return if Craig does as well. For months leading up to Spectre's release, there were rumors that the film was actually going to be a remake, or at least rehash elements of On Her Majesty's Secret Service, which sees Bond squaring off with Blofeld and has Bond getting married to a woman named Tracy, who Blofeld actually *spoilers* kills at the end of the film. Given the way that Spectre ended, it is very possible that the producers are planning something similar for Bond and Madeleine in what would be the 25th film in the franchise. The storyline would leave a lot of room for serious emotion and high stakes revenge, and could leave Craig's Bond in a good place to call it quits. Much more so than it stands currently. Granted, this is somewhat speculative, but either way some of these plot points need to be addressed in the next installment should Craig return and have potential for a satisfying installment. All is not lost though. Right after Spectre hit theaters, Craig went on the Nerdist podcast for a very casual chat and spoke a bit about the potential for his return to the franchise and addressed "slash my wrists" comment, making it seem less doom and gloom than it did originally, and he doesn't dismiss the idea entirely. "Someone asked me immediately after I finished this 'would you do another one?' And I was like 'I'd rather slash my wrists' two days after we finished...Whether there's going to be another Bond I don't know. I mean I really don't know the answer to that yet." Even if Craig is really, truly done with Bond, he will surely go down as one of the, if not the, best Bonds we have ever had, but giving his Bond's story arc a satisfying end would be of great service to the fans and to his legacy as 007. Only time will tell if Bond wraps up his arc started in Casino Royale. But one more Craig era Bond film feels like a necessity more than anything else.